Chef Max Brody (right) and D.J. 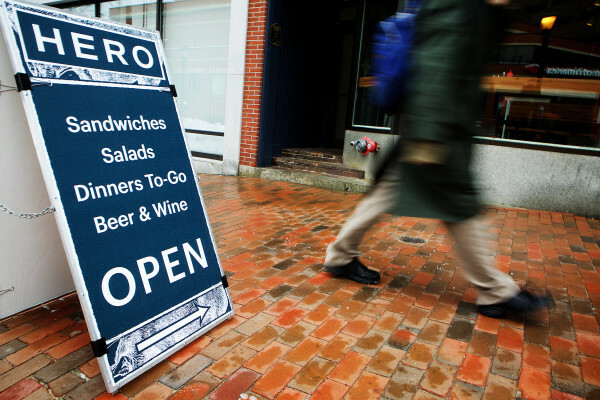 Nelson rustle up lunches at Hero, a new sandwich and rotisserie chicken joint off Monument Square in Portland on Monday. 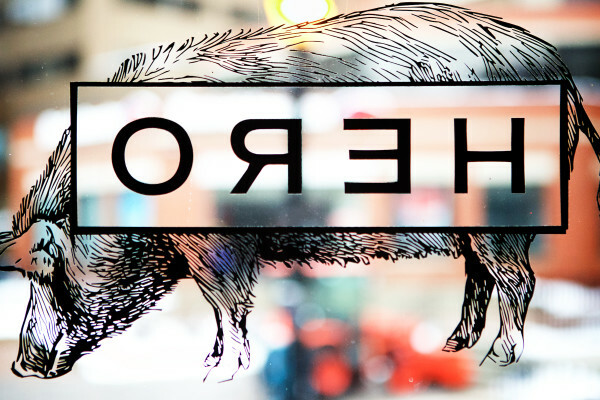 Pulled pork sandwiches with brussels sprout slaw are on the menu at Hero, a new sandwich and rotisserie chicken joint off Monument Square in Portland on Monday. 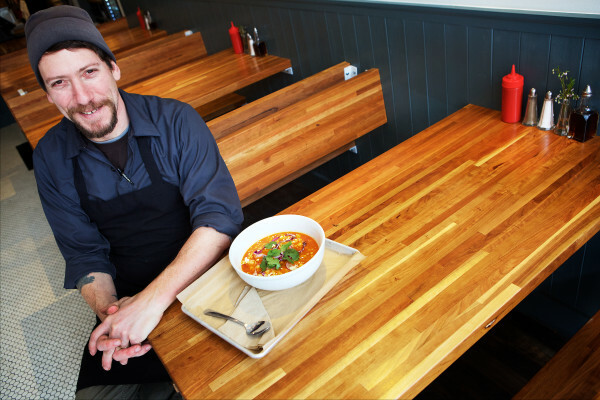 Max Brody, chef at the new Portland lunch spot Hero, sits with one of his specials on Monday: chicken pozole with cilantro, radish and hominy. The window sign at Hero, a new sandwich and rotisserie chicken joint off Monument Square in Portland, announces its presence on Monday. 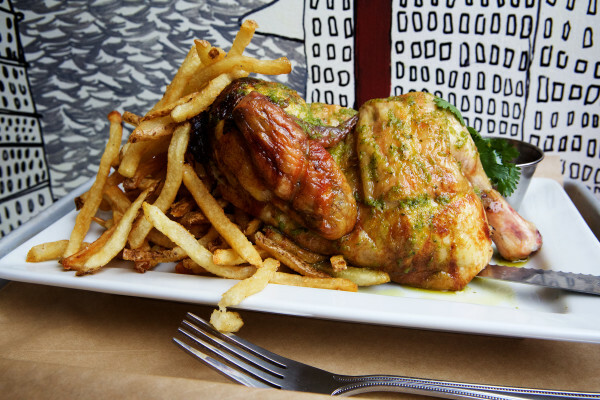 Half chickens are on the menu at Hero, a new sandwich and rotisserie chicken joint off Monument Square in Portland, on Monday. A man walks by Hero, a new sandwich and rotisserie chicken joint off Monument Square in Portland, on Monday. Michaela McVetty stands at the counter in a space on Portland's Monument Square on Monday where she plans to open Sisters Gourmet Deli. 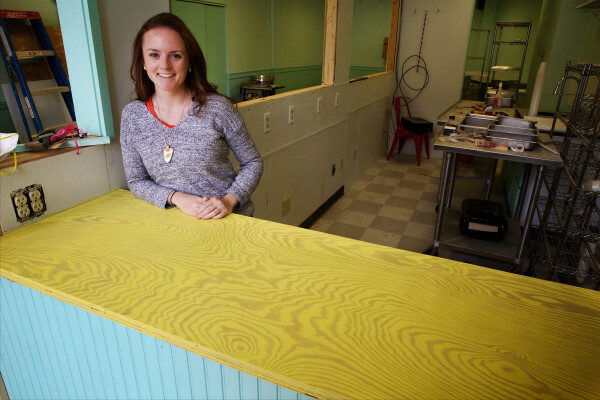 Michaela McVetty plans to open Sisters Gourmet Deli next to O! Others! coffee shop on Portland's Monument Square. PORTLAND, Maine — Lunch options in Maine’s foodiest city are springing up like snowdrops and crocuses. At 2-week-old Hero in City Center, downtown workers are treated to much more than a sandwich and a bag of chips. 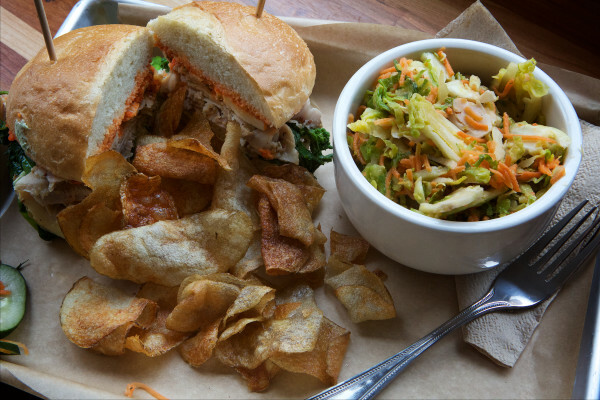 The chicken is slow-cooked on a rotisserie, the potato chips are sliced by hand, the slaw is made with Brussels sprouts. The chickpeas are chili roasted. The half-chicken for $11.75 is easier on the wallet than most knife-and-fork sit-downs. “It’s not just chicken fingers and salads. 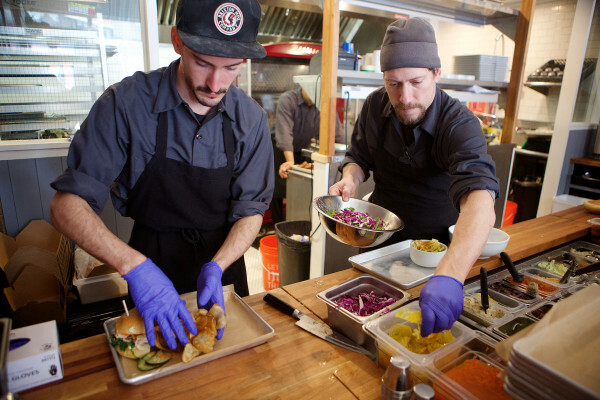 It’s substantial and healthy,” said Max Brody, executive chef of Hero, located on the same block as Longfellow Books. The new brainchild from the owners of OTTO and Empire Chinese Kitchen is doing more than keeping bellies fed; it’s getting the brown-bagging cubicle dwellers back out on the streets. “I feel that a fast, consistent and elevated counter service lunch would be a welcomed and appreciated addition to Portland’s food scene,” co-owner Todd Bernard said. He is not alone with that hunch. 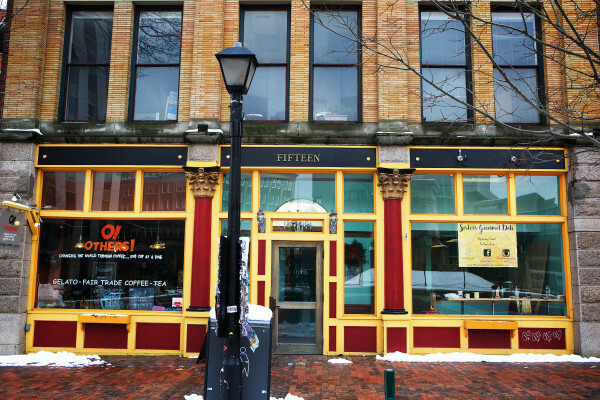 In early May, Sisters Gourmet Deli opens right around the corner in Monument Square. Owner Michaela McVetty embarks on her fourth food venture in Portland with a tempting lunch array. The cheerful, prominent space last occupied by Wannawaf was vacant for 2½ years. When Sisters opens, a new spark hopefully will quicken the pace of the business district. She also promises free delivery to harried workers who can’t leave their keyboards. Although the menu is still to be finalized, she is perfecting a Dr. Pepper pork tenderloin sandwich. “I did a taste test last week, and there was almost bloodshed over the last one remaining,” said McVetty, who was a partner in the now-shuttered White Cap Grille and Fit to Eat, both in Portland. Lunch options include shredded superfoods salad consisting of Brussels sprouts, kale and other healthful ingredients, as well as a salmon wrap with spicy cilantro yogurt sauce, carrots, cucumbers, avocado and mixed greens. “They will be light and nice for summer time,” she added. On neighboring Free Street, Tod Dana of El Rayo Taqueria expects to draw a different clientele when his second Portland Mexican restaurant opens in early June. After shuttering last fall on York Street, the new El Rayo moves closer to the city center with a more focused “quick-serve” model. “There are a lot fewer lunch options in the city compared to the many restaurants serving dinner,” Dana said. Those nighttime places, such as Top of the East in the Westin Portland Harborview, also want to get in on the lunch rush. Right now the 15th-floor room opens at 4 and 5 p.m. and for Sunday brunch. That may change come late spring. When OCHO, also owned by OTTO, relocates from Congress Street to a larger location in Longfellow Square in April, the expanded burrito menu will be another diverse option for midday noshing. Although OCHO only opened in August, the creative burrito concept was so well received that the owners needed more space. It takes over the roomy restaurant where Petite Jacqueline stood for years. Down the road at UNION at The Press Hotel, chef Josh Berry just kicked off a multicourse lunch series on Saturdays called Culinary Conversations. The three-course, $65 experience with wine takes ladies who lunch to the next level. Last week the chef carried on a friendly, personal discourse as he prepared grilled local clams and squid-ink pasta a few inches away. Seated at the chef’s bar, guests had a front-row seat as a high-end lunch came together. He fielded questions and shared cooking tips as he whipped together the astonishing spread. “This is a one-off menu that is special for guests,” Berry said. The first installment sold out fast.